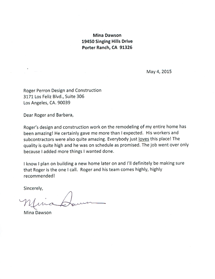 Dawson » Roger Perron Inc.
Roger’s design and construction work on the remodeling of my entire home has been amazing! He certainly gave me more than I expected. His workers and subcontractors were also quite amazing. Everybody just loves this place! The quality is quite high and he was on schedule as promised. The job went over only because I added more things I wanted done. I know I plan on building a new home later on and I’ll definitely be making sure that Roger is the one I call. Roger and his team comes highly, highly recommended!